I understand how printed pants can be scary the first time you consider buying a pair! 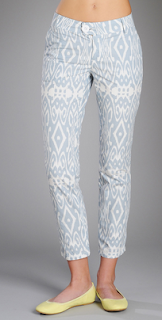 That's why I recommend getting some in a low contrast print, like these pale blue and white Aztec print ones! Great for summer, buy at South Moon Under for $114.